Emergency rooms are often hectic, crowded places where important decisions are made every day. The doctors, nurses, and other staff members assigned to the emergency room must adhere to the same standard of care as any other medical professional throughout the facility. It is when the emergency room personnel breach the standard that the patient may fall victim to medical malpractice. 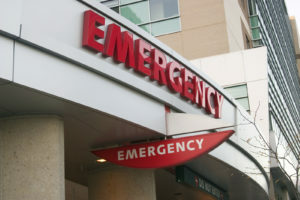 Learn more about emergency room medical malpractice in Maryland. For the medical malpractice claim to fall in your favor, it’s important to prove that the emergency department was negligent. For example, the victim must show that the doctors or nurses blatantly ignored him or her, failed to order proper testing, or refused to consult with specialists. The hospital may be liable for acts of private, non-employee physicians and other health care provides under contract. Hospitals that receive Medicare funding are subject to the rules of the Emergency Medical Treatment and Active Labor Act. The requirements of EMTALA dictate that the hospital must provide appropriate medical screening to any person requesting medical treatment in the emergency room to determine if an emergency medical condition exists. Also, the hospital must stabilize any emergency medical condition before discharging or transferring a patient to another medical facility. If the hospital does not adhere to EMTALA, the patient may be entitled to compensation. In Maryland, first responders are protected against medical malpractice claims and lawsuits. First responders are only liable if they commit a reckless, intentional act that caused injury or harm. Common examples of first responders in Maryland are the ambulance crew, medical emergency technicians, and firefighters. Furthermore, the “Good Samaritan Law” often immunizes medical personnel or persons trained in CPR for damages incurred while administering medical aid. This entry was posted on Friday, April 12th, 2019 at 11:09 am. Both comments and pings are currently closed.